Dilworth Park will be transformed with pumpkins and autumn decor, a beer garden, live music, games, and lots of fall fun for Octoberfest, presented by Saul Ewing, October 12-15. Celebrate fall in the heart of the city with the Saultoberfest Beer Garden, offering a variety of craft ales and ciders including Stella Cidre and Goose Island IPA, and autumn-inspired cocktails featuring Effen Blood Orange Vodka and Jim Beam Apple. Dilworth Park partner Live Nation will curate an entire weekend of live bands and DJs. Dilworth Park Café and Brûlée Catering will offer a special German-inspired menu. Presented by: Jim Beam Apple, Effen Blood Orange, Bud Light, Goose Island IPA and Live Nation. 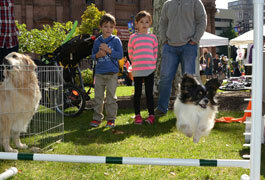 On October 8 and 15, 11am-3pm, come on out to Sister Cities Park for Fall Family Fun Days with Furry Friends Presented by TD Bank, the Pet-Friendly Bank! Celebrate fall with activities geared toward all ages. Guests can take a hay ride around the park, which will be decked out with pumpkins, scarecrows and fall decor. Face painting, balloon art and lots of fun games will be on tap both days. Families can bring their dogs, or talk to local shelters with pet adoption information. The Free Library of Philadelphia is excited to launch the Musical Instrument Collection (MIC), an instrument lending library for library cardholders. Customers are able to borrow musical instruments from the Music Department in the Parkway Central Library. The MIC offfers six fretted string instruments—electric guitar, electric bass guitar, acoustic electric guitar, ukulele, banjo, and mandolin. This initiative aims to heighten musical information literacy and enrich the lives of Library customers in the arts, engaging them further with the cultural community around them. Through October 31, the City of Philadelphia Mural Arts Program is observing Mural Arts Month 2016, a look at the program's journey- its history and future. The month-long celebration includes thought-provoking panels, live art experiences, parties, mural dedications, tours, and community celebrations around the city. Visit MuralArts.org for a complete schedule of events. Starting on October 8, explore a cutting-edge collection of robots from around the world in Robot Revolution, a new Franklin Institute exhibit supported by Google.org with additional major support from The Boeing Company. Meet machines of the future and dive into the next generation of technology. Interact with robots that have rarely been shown to the public—from soccer-playing robots to impressive humanoids— and witness how these amazing machines can change how we live, work and play. The Barnes Foundation's Live and Life Will Give You Pictures is a new exhibition of vintage prints of nearly 200 classic images made between 1890 and 1950 by French photographers and photographers working extensively in France. Drawn exclusively from the private collection of Michael Mattis and Judy Hochberg, Live and Life Will Give You Pictures includes work by such masters as Berenice Abbott, Eugène Atget, Erwin Blumenfeld, Brassaï, Henri Cartier-Bresson, Edgar Degas, Eugène Druet, Jacque-Henri Lartigue, Dora Maar, Man Ray, Lisette Model, László Moholy-Nagy, and Félix Thiollier. The exhibition opens October 8 and runs through January 9, 2017.